© Godoy et al. ; Licensee Bentham Open. The aim of this study was to evaluate complications experienced during implantation of the Braile Vena Cava filter (VCF) and the efficacy of the centralization mechanism of the filter. This retrospective cohort study evaluated all Braile Biomédica VCFs implanted from 2004 to 2009 in Hospital de Base Medicine School in São José do Rio Preto, Brazil. Of particular concern was the filter’s symmetry during implantation and complications experienced during the procedure. All the angiographic examinations performed during the implantation of the filters were analyzed in respect to the following parameters: migration of the filter, non-opening or difficulties in the implantation and centralization of the filter. A total of 112 Braile CVFs were implanted and there were no reports of filter opening difficulties or in respect to migration. Asymmetry was observed in 1/112 (0.9%) cases. A statistically significant difference was seen on comparing historical data on decentralization of the Greenfield filter with the data of this study. The Braile Biomédico filter is an evolution of the Greenfield filter providing improved embolus capture and better implantation symmetry. Keywords: Vena cava filter, Deep venous thrombosis, Pulmonar embolism, Prevention..
Vena Cava filters (VCFs) are used to prevent pulmonary embolism in patients with DVT who are unresponsive to anticoagulation therapy . Inferior VCFs are metal alloy devices that mechanically trap fragmented thromboemboli from the deep leg veins en route to the pulmonary circulation . The function of VCFs to prevent pulmonary embolism while maintaining caval patency is associated with the design. Several characteristics have been reported. The major differences between device types include the anchoring, the volume and number of trapping levels, and the amount of metal in the VCF . There have been numerous devices developed for this purpose, each of which has its proprietary design considerations that affect the performance and potentially impose limitations with regards to positioning, efficacy and risk profile . One of the problems regarding the implantation of the Greenfield filter is the possibility of decentralized placement. One study reported an in vitro experiment that demonstrated that decentralization of this filter interferes in the efficacy of emboli capture . Literature refers to a decentralization index of from 5 to 37% [6-8]. The aim of this study was to evaluate the complications experienced during implantation of the Braile VCF and the efficacy of the centralization mechanism of this filter. This retrospective cohort study evaluated all Braile Biomédica VCFs implanted from 2004 to 2009 in Hospital de Base Medicine School in São José do Rio Preto, Brazil. Of particular concern was the filter’s symmetry during implantation and complications experienced during the procedure. All the angiographic examinations performed during the implantation of the filters were analyzed in respect to the following parameters: migration of the filter, non-opening or difficulties in the implantation and centralization of the filter. The asymmetry reported in a published series of Greenfield filters was from 5% to 37% of implantations [6-8]. For this study the lowest prevalence was used as a control for comparison purposes, that is, a decentralization rate of 5% (42/373 implantations). The Braile filter has eight struts in the capture mechanism and four for anchoring purposes (Fig. 1). Anchoring mechanism of the Braile vena cava filter. Descriptive data and the Fischer Exact test were utilized for statistical analysis. This study was approved by the Research Ethics Committee of the Medicine School in São José do Rio Preto (FAMERP - N°312 -2010). A total of 112 Braile CVFs were implanted in this period in patients with ages that ranged from 18 to 83 years old and a mean of 61.7 years old. There were no reports of filter opening difficulties or in respect to migration. Asymmetry was observed in 1/112 (0.9%) cases. For 2/112 (1.8%) cases, the anchoring struts were not adhered to the wall of the vena cava, that is, they were anchored in the lumen of the renal vein, however no thrombosis was identified during the evaluation. A statistically significant difference was seen on comparing historical data on decentralization of the Greenfield filter with the data of this study. The current study evaluated a new VCF; the objective of developing this filter was to try to improve the efficacy of capturing emboli compared to the Greenfield filter to. One problem that was identified with the Greenfield filter is that it was frequently implanted asymmetrically [6-8] . Hence, the efficacy to capture emboli was reduced due to the increased area through which the emboli could escape . However, this study does not directly compare the two filters. Rather it compares recently implanted Braile VCFs with historical data for the Greenfield filter. Moreover, the lack of comparison to other vena cava filters constitutes another limitation in this study. The Braile filter was developed using a system of four anchoring struts, that is, similar to a stent-filter . Another aspect was the addition of another two struts, totaling eight struts, to capture the emboli. Thus the result of these changes was to improve the anchoring of the device, to reduce the distance between struts thereby reducing the area through which emboli can escape and to reduce the diameter of the filter. In this study, failure of centralization occurred in 1 (0.9%) of the implanted filters, a figure much lower than that reported for the Greenfield filter when historical data are consulted. The Braile filter was evaluated in vitro and proved to be more efficacious than the Greenfield filter in capturing emboli . This study evaluated the failures and difficulties during implantation of all filters utilized between 2004 and 2009. No difficulties in releasing the filter were reported. However, during the placement of two filters, one strut of each remained in the lumen of the renal vein. Even so thrombosis of the renal vein was not observed although further studies evaluating the evolution of these patients are prudent. Complications such as thrombosis of the vena cava were not routinely evaluated in these patients except when there was clinical suspicion. All patients were from the national healthcare system and treated in one hospital and so the entire follow up of all patients was carried out in the same institution. The Braile Biomédico filter is an improvement on the Greenfield filter providing improved embolus capture and better implantation symmetry. Swaminathan TN, Hu HH, Patel AA. Numerical analysis of the hemodynamics and embolus capture of a Greenfield vena cava filter J Biomech Eng 2006; 128(3 ): 360-70. Young T, Tang H, Hughes R. Vena caval filters for the prevention of pulmonary embolism Cochrane Database Syst Rev 2010; 17(2 ): CD006212. Proctor MC, Greenfield LJ. Form and function of vena cava filters: how do optional filters measure up? Vascular 2008; 16(1 ): 10-6. Rundback JH, Zybulewski A, Manno J. 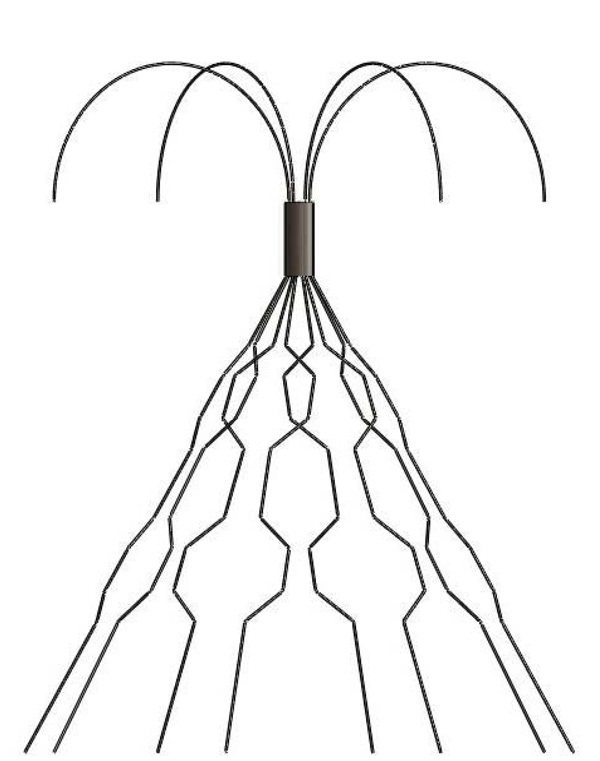 Permanent or temporary IVC filtration with a novel double-ring anchoring technology optional nitinol filter Expert Rev Med Devices 2010; 7(1 ): 11-9. Godoy JMP, Gaillard AL. Decentralization can interfere in the efficacy in capturing the embolus in vitro study Clin Exp Med Lett 2007; 48(2 ): 95-6. Greenfield LJ, Proctor MC, Cho KJ, Wakefield TW. Limb asymmetry in titanium Greenfield filters: clinically significant? J Vasc Surg 1997; 26(5 ): 770-5. Cho KJ, Greenfield LJ, Proctor MC, et al. Evaluation of a new percutaneous stainless steel Greenfield filter J Vasc Interv Radiol 1997; 8(2 ): 181-7. Johnson SP, Raiken DP, Grebe PJ, Diffin DC, Leyendecker JR. Single institution prospective evaluation of the over-the-wire Greenfield vena caval filter J Vasc Interv Radiol 1998; 9(5 ): 766-3. De Godoy JM, Braile DM. In-vitro evaluation of a new inferior vena cava filter-the stent-filter Vasc Endovascular Surg 2004; 38(3 ): 225-8.